Free Shipping Included! 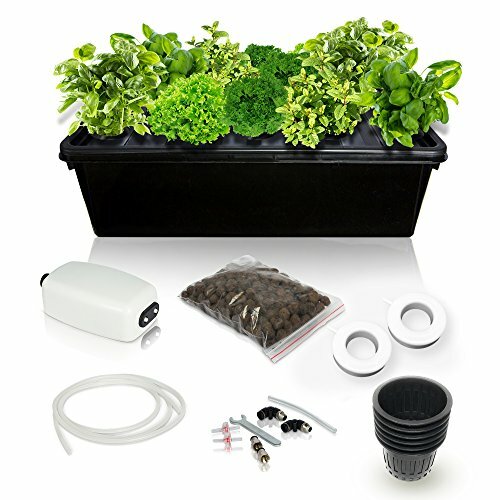 SavvyGrow DWC Hydroponics Growing System Kit - 2 Large Airstone, 14 Plant Sites (holes) Bucket w/Air Pump - Best Indoor Herb Garden for Cilantro, Mint - Complete Hydroponic Setup Grow Fast at Home by by SavvyGrow at Tulips Orchids. MPN: 43237-2. Hurry! Limited time offer. Offer valid only while supplies last. Ever wanted fresh herbs & salads but you don't have a garden, or your soil is too poor? The SavvyGrowDWC Hydroponic System lets you do it indoors. ✔ BIG RESERVOIR MEANS BIG PLANTS... grow 14 together from seeds or seedling; place basil by tomato, lettuce with paprika, then add water & root supplement, now watch them grow!